"The collection is personal and universal, grounded in the small towns of the Inland Northwest that Venn knows so well..."
"In his latest collection of essays, Keeping the Swarm, Venn again reflects his strong ties to and affection for the Pacific Northwest...Intensely personal and intimate, these essays reflect a thoughtful nostalgia and gentle sensibility...Venn offers many memorable moments." "This welcome essay collection by the sharpest-eyed Northwest writer conjures the region he knows so intimately. His careful portraits of mining towns, wheat harvest, bee keeping, snowland wonders ring clean and true... This venerable voice blesses every reader with another brave and rewarding book." "Keeping the Swarm is an intimate, powerful portrait of community. Dipping his pen into a mix of blood and honey, George Venn braves the scabrous terrain of memory. Venn's prose is powerful, his narrative vulnerable. The Poet's abiding respect for creatures and for environment, for song and for languages...shines brightly here. This book will make you thirst for the clear water of the mountains, and hunger for the amber-nectar of home." "George Venn is a gentle radical: In lyrical prose he enchants us with the closely observed words and acts of ordinary people--from the Northwest's small towns to classrooms in post-Cultural Revolution Hunan--always connecting this fabric of local life to the global issues of social justice and human interdependence. 'Who says literature makes nothing happen?' Venn asks. His memorable essays inspire us to go beyond humanities to humanitarian work." 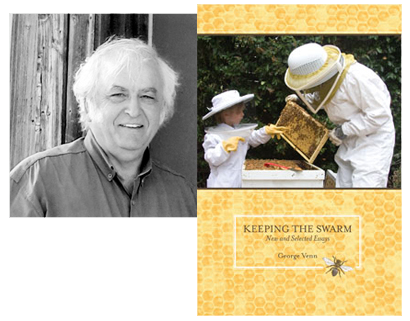 "In Keeping the Swarm, George Venn both asks and answers the question, "After all, what are writers for?' ...In clear-eyed, honest, and eloquent fashion, Venn examines the places and people of his childhood and adulthood, proving that the pedestrian and the profound exist...[and] coalesce to form our most sacred guidebook for us to examine our own piece of the world, to recognize the beauty, grace, and peril..."
"In his latest collection of essays, Keeping the Swarm, Venn again reflects his strong ties to and affection for the Pacific Northwest...intensely personal and intimate, these essays reflect a thoughtful nostalgia and gentle sensibility...touches of powerful writing [and] many memorable moments." "From the gorgeous cover photo by California beekeeper-photographer Kodua Galieti to the very personal family photos and gentle boyhood remembrances, Venn paints a picture of beekeeping and family forever intertwined."